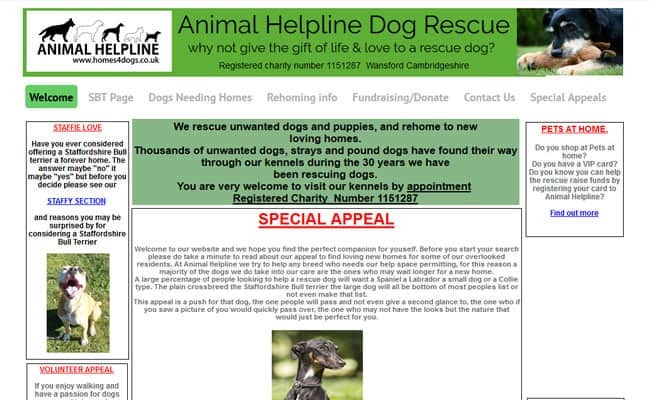 Animal Helpline Dog Rescue, Peterborough – Animal Helpline Dog Rescue helps rescue unwanted dogs and puppies, and rehome them in new, loving homes. Animal Helpline Dog Rescue has taken in thousands of unwanted dogs, strays and pound dogs at kennels during the 30 years we have been rescuing dogs. There are always dogs waiting for new homes and potential adopters are very welcome to visit our kennels, but please make an appointment first!